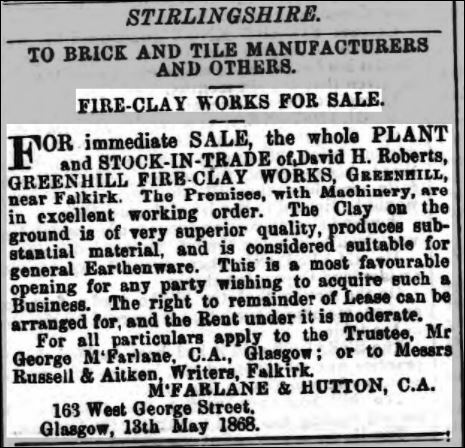 Greenhill Fireclay works, Clayknowes, Bonnybridge – Alexander and John Scott owned the farm and brickworks at Clayknowes and Cadgersgate according to the valuation roll of 1865, Slater’s Directory of 1867, refers to the Greenhill Fireclay works being worked by Scott & Walker. The brickworks is not shown on the maps of 1854, so it probably started about 1860. 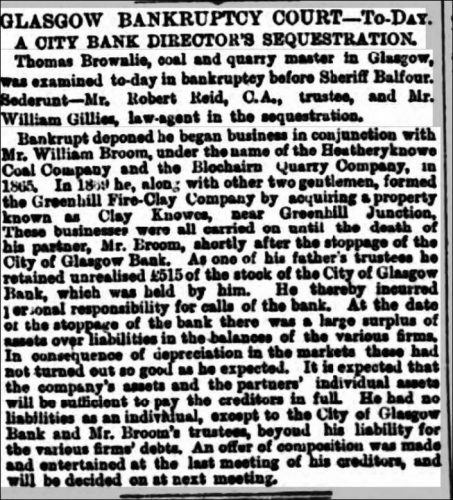 The Greenhill Fireclay Company had passed into the hands of the partners, William Brown and Thomas Brownlee of Glasgow and George Caddell Bruce of Edinburgh by 1875. Brownlee and Bruce still owned it in 1880, but by 1895 when it was owned by James and William Wood, the brickworks was in ruins. 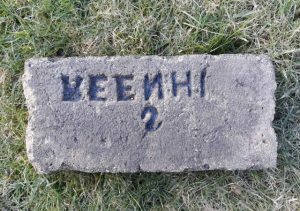 The site was used by several explosive manufacturers before and during the First World War and suffered several accidental explosions. 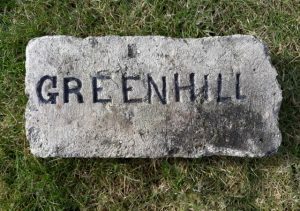 No more bricks were made on this site, although a Greenhill Fireclay Company was incorporated in October 1920, with James Ferguson, Managing Director of Lane & Girvan, the Bonnybridge iron founders, one of the principal shareholders. This company was liquidated in 1922, when Ferguson took an interest in the re-structured Glenyards Fireclay Company at Greenhill Railway junction, as a Director of James Anderson & Co. Ltd. Source – Kenneth Sanderson. 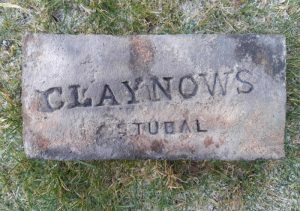 1860 – Clayknowes Brick Works, Bonnybridge are not detailed. 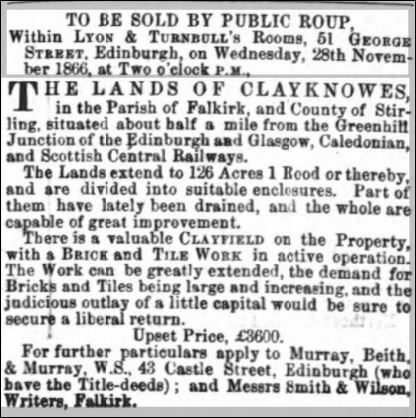 Below – 08/03/1860 – Falkirk Herald – The clayfield at Clayknowes for sale. 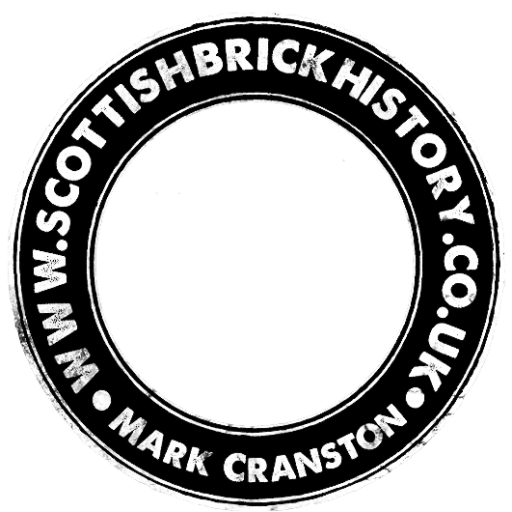 14/04/1864 – Falkirk Herald – Reference to John Scott, brick and tile manufacturer, Clayknowes. 25/03/1868 – Glasgow Herald – To be sold by public roup. Upset price greatly reduced. 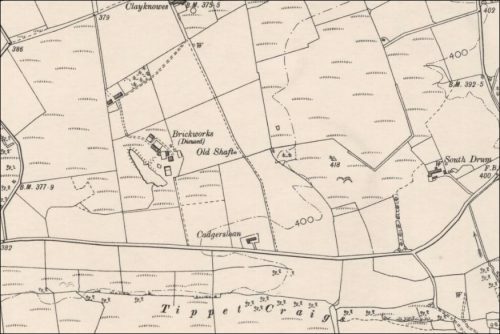 The lands of Clayknowes in the parish of Falkirk and County of Stirling situated about 1/2 mile from the Greenhill junction of the Edinburgh and Glasgow, Caledonian and Scottish Central Railways. The lands extend to 126 acres or thereby and are divided into suitable enclosures. Part of them have lately been drained and the whole are capable of great improvement. There is a valuable clay field on the property with a brick and tile work in operation.. The work can be greatly extended, the demand for brick and tiles being large and increasing, and the judicious outlay of a little capital would be sure to secure a liberal return…..
1869 – Thomas Brownlie plus two others (William Broom?) 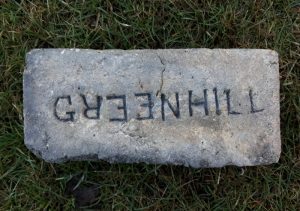 formed the Greenhill Fireclay Company by acquiring a property known as Clay Knowes near Greenhill Junction. 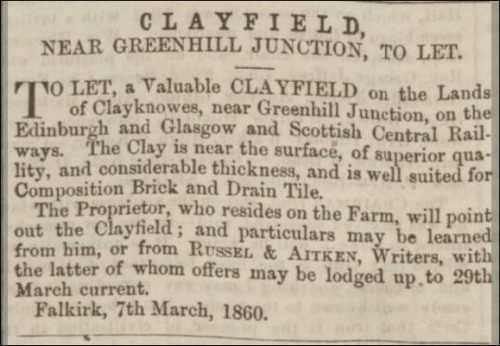 01/09/1870 – Falkirk Herald – Contractors wanted for carting fireclay goods from Greenhill Fireclay Works on the lands of Clayknowes to Greenhill Railway Station. Also coals from said Station to Works. Contractors to state price per ton for coals and per 1000 bricks. Full particulars will be given on application to James Affleck, Clayknowes by Denny. 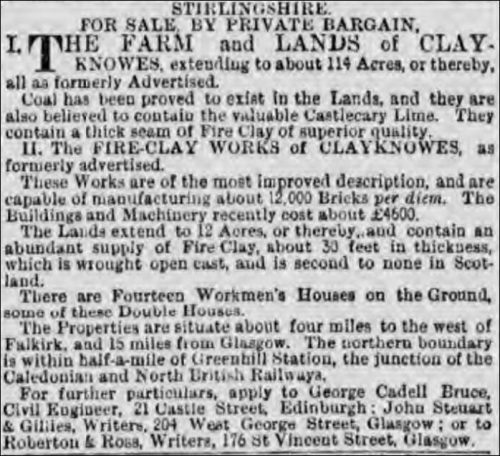 Below – 02/07/1880 – Glasgow Herald – Farm and Fireclay Works at Clayknowes for sale. 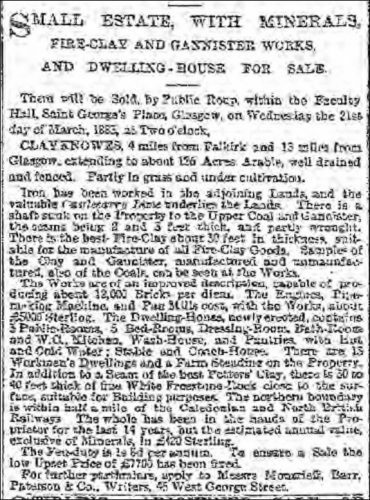 Below – 09/02/1881 – Glasgow Herald – Farm and Fireclay Works at Clayknowes for sale – formerly occupied by the Greenhill Fireclay Company. 10/11/1882 – Glasgow Herald – For sale, cheap, 100 fathoms of boring rods with other boring appliances. Also a good 1 1/2 ton crane, Clayknowes Fireclay Works, Greenhill. 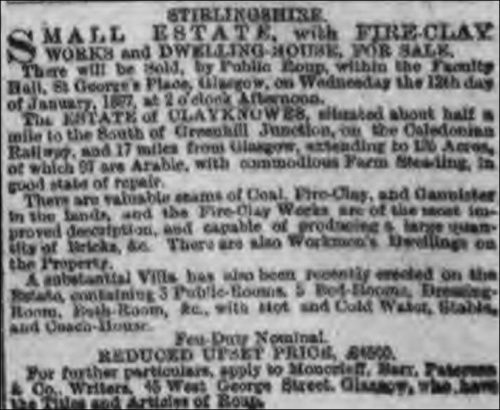 Below – 07/03/1883 – Glasgow Herald – Clayknowes fire clay and gannister works for sale. 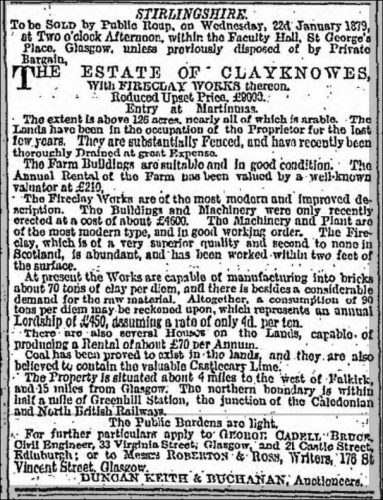 Below – 12/01/1887 – Glasgow Herald – The estate of Clayknowes with fireclay works thereon. Below – 1896 – Clayknowes Brick Works, Bonnybridge (disused). Previous Article Slag retention balls manufactured at the Manuel Works, Whitecross. 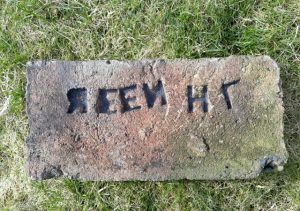 Found at Lochdrum Farm, Bonnybridge. Yet another badly stamped variation with the ‘G’ reversed, the ‘R’ upside down, the ‘N’ missing. 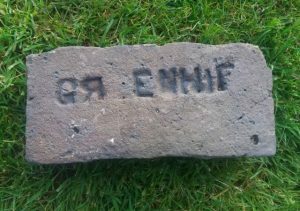 This brick was likely made by the Greenhill Fireclay Works, Bonnybridge. 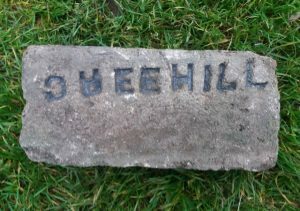 Believed to be sited at Clayknowes and later taken over and renamed the Greenhill Fireclay Company. . . .